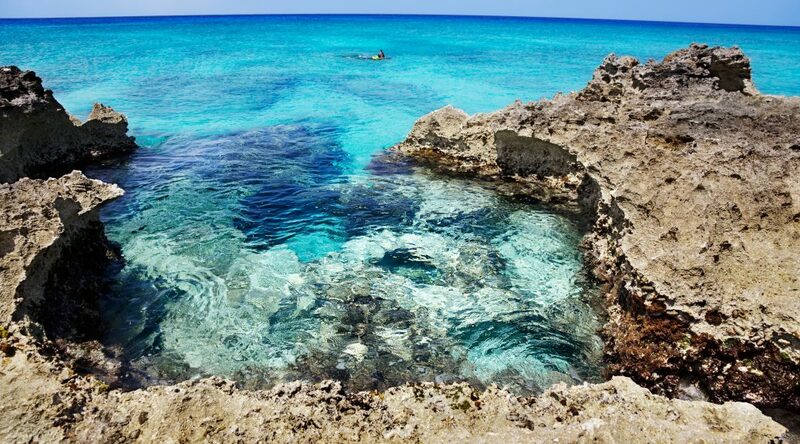 Taking a road trip on Grand Cayman allows you to see and experience activities and attractions that aren’t always highlighted in guide books and tour groups. Aside from the bigger destinations that you’ve likely read or heard about, you can take in many unique, small spots when you road trip on our island. Starting in George Town and ending at the iconic Rum Point, follow this suggested road trip to enjoy a special take on the culture, history, and beauty of Grand Cayman. Leave George Town and head along the coast on South Church Street, where you’ll pass Grand Old House, one of Grand Cayman’s top restaurants and a local landmark. Stop at Smith Cove to take in the view and to snorkel with rainbow-colored fish if you like. Off of Bay Road, as it turns into Jack Road, you’ll find Prospect Village, Grand Cayman’s first settlement that is now a ghost town of sorts. You can still see an established fort and outpost here, which were erected in the latter half of the 1700s. There is a village church (abandoned in 1932), Watler Family Cemetery (dating from the 1800s), and a bit of beach (with shelters and toilets) to explore while here. Continue on Jack Road until you get to the Village of Spotts, another historic village that is currently a private residential community. The Cayman Islands government’s plans are to turn the coast in the village into a public park and to develop the area as a docking space for cruise ships. A sandy public beach sits between sections of rocks and is a favorite swimming spot. From the Village of Spots, take a short detour north on Governor Spotts Newlands Road to visit the Governor Michael Gore Bird Sanctuary. This wildlife preserve is open all day, and it’s especially beautiful from April to June. This is when the most birds are present at the sanctuary, roughly 60 species of land and water birds. At least a quarter of the Cayman Islands’ native bird species call this refuge their home. Many of them use the two-acre freshwater pool at the center to cool off and quench their thirst. Continue on your Grand Cayman road trip to discover the Village of Savannah, Pedro St. James National Historic Site, Bodden Town, and Meagre Bay Pond.